Every craft has its own “language”, and sewing is no different. Learn sewing terminology so that every sewing project you undertake will be more fun and less confusing. In sewing, one of the hardest things is figuring out the directions on a pattern. Some pattern pieces need to be cut on the “selvage” edge. This is the edge of fabric that has been finished and will not fray. Many fabrics have an obvious selvage edge, but some don't. Pattern pieces often require the “nap” to be in the same direction, or cut with the “right side facing”. Determining if your fabric has a “nap” is critical to having an enjoyable and successful sewing project. When working with a “nap” fabric, such as velvet, if you don’t cut the fabric properly, the result looks bad. You will have to buy more fabric and fix the pieces you cut wrong. Without experience, many of the pattern terms don’t seem to make any sense. For example, when a pattern directs you to “bias cut” the fabric, you may decide to ignore the direction. Don’t. Bias cutting material allows the fabric to fall (drape) more fluidly, causing a different amount of “stretch” in the fabric. 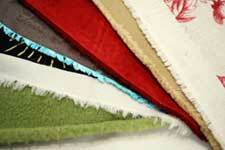 Understanding sewing terminology will help you to make better fabric choices. This will make working with your pattern easier. There's So Many Kinds Of Thread! Discover the amazing selections of threads at Thread Art! Decorative thread is less important than the thread used to bind the fabric pieces together. 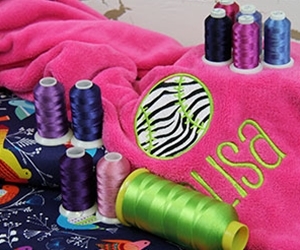 Knowing if “mercerized” is better or not, and understanding the content and weight of the thread is important to successfully finishing your sewing project. A general rule is the type of fabric determines the type of thread. Quilting thread is heavier and thicker than most standard threads and does not work well in a sewing machine, as it is for hand quilting. However, there is “machine quilting thread”. This thread is perfect for use in a sewing machine, but not on a chiffon blouse. Learning how to select the right thread for the right fabric starts with understanding thread terms. Once you have the pattern, fabric and thread and the pattern cut out, it’s time to sew your project. Sewing machines start at a basic machine, which usually has a few “stitch types” , such as “zig zag” or “straight” stitch, and go up to computerized machines, which can top stitch decorative designs with the touch of a button. 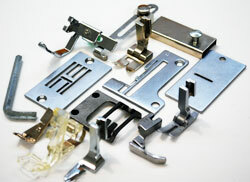 However, sewing machines come with their own “language” and may have a “presser foot”, a “foot control” and “feed dogs”. Without understanding the parts of the machine, and how all the controls work together, the pattern, fabric and thread, you’ve taken such care to combine may end up as a huge mess! The language of sewing, material, threads and machines may seem overwhelming, but learning basic sewing terminology will give you a better understanding of how all the pieces in a sewing project work together.